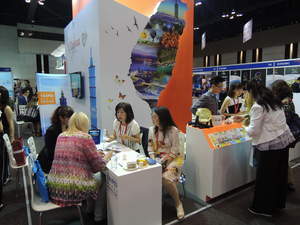 TAIPEI, TAIWAN--(Marketwired - Sep 28, 2016) - Seeking to actively expand the ASEAN tourism market, this year the Taipei City Government Department of Information and Tourism (TPE-DOIT) has participated in major tourism exhibitions in Malaysia, Indonesia, Vietnam, Singapore, and other locations. It is now participating in IT&CMA in Bangkok, which runs September 27 through 29, marketing Taipei City's high-quality MICE environment to international buyers. Over the past two years the situation in Europe and the United States has become somewhat more complicated, turning eyes to the MICE market in Asian cities. Hence, through participation in the Bangkok exhibition and interchange with Southeast Asia buyers and professional tourism-industry enterprises, the Taipei City incentive-travel market is being promoted and at the same time "New Go South" tourism development is being implemented. TPE-DOIT is continuing usage of its "Taipei Makes Perfection" at this show. Once again emphasizing the first-rate quality and quantity of Taipei City's hard-infrastructure facilities, and its leading position in Taiwan, a diversity of exciting sightseeing-tourism support initiatives are also being showcased. In keeping with development of Taiwan's "New Go South" policy, seeking to expand the Southeast Asia tourist market, as of August this year travelers from Thailand and Brunei have enjoyed visa-free entry into Taiwan. DOIT has developed a variety of promotion activities to express its welcome. Starting August 1, travelers presenting a Thailand passport and boarding pass for Taiwan travel were eligible to immediately receive a DOIT-supplied EasyCard. This promotion generated an enthusiastic response, and the limited-edition supply of 500 cards was quickly claimed. The MICE market is now being specially targeted, and in order to create even more practical benefits for visitors, DOIT has announced that from now until the end of 2016 "Incentive Travel Groups" coming to Taiwan that have followed DOIT's MICE sponsorship application guidelines will, in addition to all sponsorship-program support offered in accordance with their original applications, receive a bonus Taipei Pass (1-Day Pass) for each travel-group member. There are no restrictions in regard to nationality and no limits as to numbers. Foreign friends of Taipei on incentive-travel trips can enjoy a full day of free unlimited travel on the Taipei Metro and on Taipei City/New Taipei City public buses, experiencing Taipei's ultra-convenient public transportation and local living style. This extra bonus gift has generated much enthusiasm among MICE-event participants, making Taipei visits an even happier and more convenient experience. During Taiwan international-media press conference held Sept.28, DOIT Senior Specialist Jiang Chuen-huey used films on cultural-creativity and fine cuisine to elaborate on the soft power of Taipei MICE, and invited everyone to come to Taipei next year for the 2017 Taipei Summer Universiade, heading out on sightseeing outings in between competitions. Taipei's Eagle Tour travel enterprise is also attending the expo, working with DOIT, and Eagle Tour Chairperson Judy Lin (Lin Yuhua) stated that since the inauguration of Taiwan's visa-free policy the number of Thai incentive-travel visitors has increased significantly. She added that the many measures taken by Taipei in recent years to create a welcoming environment for Muslim-traveler friends is another strong incentive attracting more tourists to Taiwan. At this exhibition, DOIT is set up within the Taiwan Pavilion organized by the Taiwan Tourism Bureau, Ministry of Transportation and Communications. During the show it is using a fun-packed LuckyDraw game to attract the interest of international buyers, who can play to win Taipei City souvenir merchandise, popular gift items, and other premium prizes. After the close of the exhibition specially created MICE EDM (Electronic Direct Mail) will be e-mailed to international buyers, enabling them to quickly and conveniently comprehend information coming from Taiwan on all matters. As well during the show, an "early-adopter taste-test service" is being provided at the Taipei stand, matching premium Taipei teas with popular Honey Taipei confections. These unique enticements have made the Taiwan Pavilion one of the exhibition's hottest stopping points with international buyers. TPE-DOIT Senior Specialist Jiang Chuen-Huey showcased the Taipei MICE Sponsorship at the Taipei Stand.